With somewhat under 700 million inhabitants, the planet is quite thinly populated. The Cindu day is roughly 25 hours 20 minutes long, and the year is 464 days-- that divides nicely into 16 months of 29 days each. (Thus a Cindu year is equal to about 490 earth days, or 1.34 earth years; our year is thus about .75 Cindu years.) In their most widely used calendar, the year begins on the Northern Hemisphere's Spring Equinox. Each month is divided into four 7-day weeks, with an extra un-numbered day in the middle. The names of the days (in Kash) are: lembrim, uwam, kayiñ, vuruna, imbar, turat, lalap; the mid-month day is cinjurak-- it falls between the 14th and 15th of each month. The day is divided into 20 hours, of 50 minutes of 100 seconds, and begins, conventionally, at midnight (0100, aro mes 'one o'clock' to them). 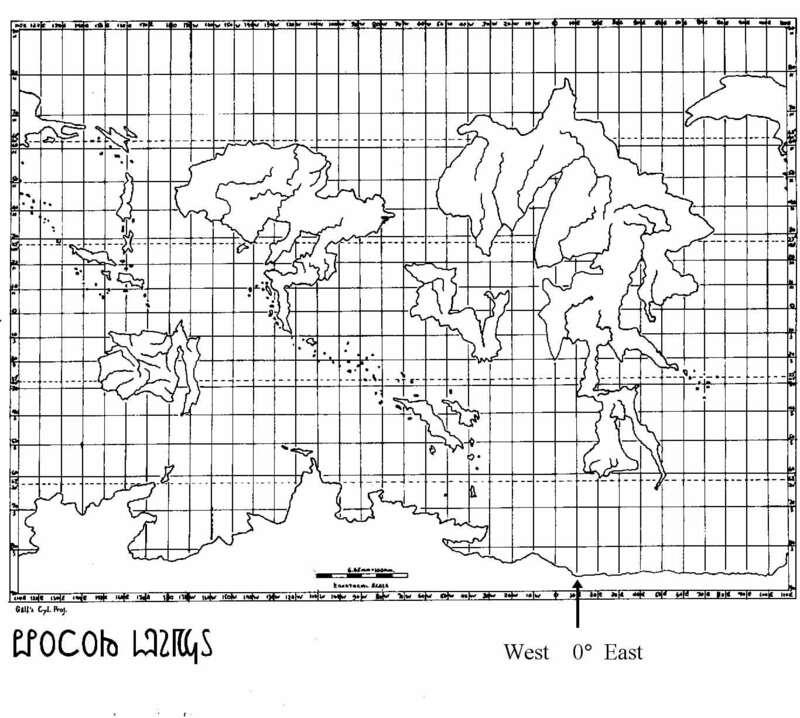 There are, thus, 20 time-zones, each covering roughly 18° of longitude. For weights and measures, a decimal system is used. Temperatures correspond to our Celsius scale. The basic unit of measurement is the li (a Gwr word)-- like our metre, it is one ten-millionth of the Pole-Equator distance, which works out to 1.1172 metres. The Kash are one of three intelligent, civilized species who inhabit Cindu. We have to assume that in the course of their evolution from a "great cat" species, their vocal tract (and probably to some extent their minds) came to resemble ours, more or less-- otherwise, it would be difficult to describe their language in any comprehensible way. Physically, I see them as large-- average height almost 2 metres-- and covered with smooth black fur-- imagine a panther-like animal standing erect (but no tail!). They are telepathic. There are approximately 400 million of them, speaking many languages; the one described here is spoken by about 40 million, who live in a federation of five more or less autonomous states on the Australia-size island Yanatros. Other Kash nations are located on the two large continents and in the islands, generally in the tropics, roughly between 30°N - 30°S. The other main intelligent species, of whom we will say little more at this point, are the Gwr (phonetic [gw3^], where [3^] is the vowel+r sound in Engl. "her"); they live mainly in the northern reaches of the planet, mostly above 30°N, and descend from a (to our view) more simian-like ancestor. They are smaller-- average height about 1.5 metres-- but also furry, usually brown, sometimes black, and are not telepathic. In their own view, they are very clever (too clever by half, say the Kash), and in fact historically are responsible for much of the technological development on the planet. Their languages are unrelated to Kash, but have contributed many loan-words over the ages. Unfortunately, they had, and may still have, the bad habit of letting their cleverness get the better of common sense. For example, about 1000 years ago, having devised primitive nuclear weapons, their two principal nations held a little war, known as The Destruction, which decimated their numbers, devastated their societies, and set the entire planet back several hundred years. As a result the Gwr went from majority population to minority (they now number about 275 million), and it fell to the Kash to take over effective leadership of the planet. There have been no wars since that time. The third intelligent species are the Lañ-lañ. Like the Kash, they are descended from a different "great cat" species than the Kash--they are somewhat smaller, of different colors and, most importantly, lack telepathic ability and cannot interbreed with Kash. Their origin is something of a mystery. Numbering some 300,000, they are found only on Yanatros Island (with small remnant populations on the islands to the northwest of Yanatros). After unfortunate experiences with the first Kash settlers, they retreated to the mountainous interior--their region is now semi-autonomous, and they prefer to have few dealings with the Kash or, indeed, the modern world. They maintain a traditional lifestyle. Most Kash have never seen a Lañ-lañ except perhaps on TV or in their equivalent of "National Geographic", and are considered as quite an exotic and (to non-expert eyes) "primitive" people. In current world-wide use is a decimal system, comparable to our metric system. Older non-decimal systems are still used in a few areas. Although first devised by the Kash (the Gwr originally counted in base-8), most of the terms are Gwr words. The basic unit of linear measure is the li, based, as our metre originally was, on one ten-millionth of the distance from pole to equator-- it works out to 1.1172 metres, or 43.98 inches = 3.665 ft. The li is divided into 1000 parts, apali (~millimetre); 10 apali = 1 kuroli (~centimetre). Also in use are colloquial angundi, poli and kukali-- resp. l/2, 1/10 and 1/4 li (these prefixes are Kash forms). Equivalent to our kilometre is the cili (Gwr '1000 li', Kash also uses pacili), equal to 1.1172km. or .694 miles. The basic unit of weight is the cipem (Gwr '1000 pem' ~kilogram)-- the weight of 1000 cubic kuroli of water-- that is, the equivalent of 103 kuroli (=11.172cm3 or 1394.41cc) or 1.394 kg. or 3.067 lbs. (49.0688 oz.). A pem (~gram) is approximately .05 oz. ; 20 pem are approximately 1 ounce. For liquid measure, the term is cipetu (Gwr cipem + Kash su 'water' ~litre), with 1 petu corresponding to millilitre-- 1 cipetu is equal to 1.394 litres or 1.5334 US quarts. When buying or measuring small quantities, the term kosi (~kos) refers to 100 pem/petu. 100 pem/petu (1 kos ~kosi) (cf. Dutch ons = 100 gm.) approx. 5 oz. Kash currency is also decimal; most widely used in the taruna (colloq. truni), probably equal in purchasing power to approximately US$1.25 (as of early 2002). It is divided into 100 parts, called kurok (~kroki), with coins for 1, 2, 5, l0, 25 and 50kr; there are also 1 and 2 truni coins. Paper bills exist in denominations of 5, 10, 25, 50 and 100tr. Coins in general are popularly called tomici 'little money', bills tokapra 'paper money'. "How to tell if you're a Kash"
"How to tell if you're a Gwr"